I’ve been thinking about the Kansas State Fair a lot in these past few weeks. I can’t believe in a month the fair will be rolling around again. The kids will have been back in school for a few weeks, and my house should be clean again. Well, I can dream, can’t I? Combine all of the ingredients except for the egg roll wrappers in a large bowl and gently mix well. Place an egg roll wrapper on counter with a point facing toward you. Place ¼ cup of the mixture toward the lower ⅓ of the egg roll wrapper and fold the point up away from you. Roll tightly away from you and fold the sides in. Dip your finger in a little bowl of water and run it along the other point and finish rolling eggroll pressing to seal the point. At this point you can freeze the eggrolls. I put them on a baking sheet in the freezer for an hour or so and then remove to freezer bags. Don’t thaw before baking or frying because the egg rolls will become soggy. When baking or frying frozen egg rolls, follow instructions, just cook for a little longer. Fry in batches not crowding the fryer. It doesn’t take long so watch carefully until they are a golden brown, just about 2 minutes or so. Remove to a rack to cool and let the oil drain for 2 minutes before eating. Place a cooling rack in a jelly roll pan and coat with non-stick cooking spray. Put eggrolls on cooling rack and coat the tops with cooking spray. Bake in oven for 12-15 minutes until lightly browned. 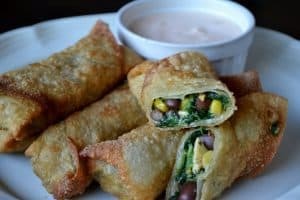 While eggrolls are baking mix the ingredients for your dipping sauce. Thank you Cindi! I’ve never thought of using the filling in a wrap. I will definitely be trying that soon. Thanks for stopping by!